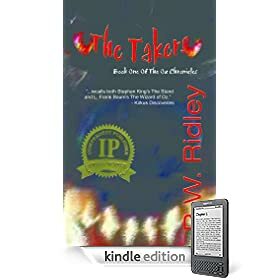 The Takers, Book 1 of The Oz Chronicles by R W Ridley is my bargain ebook of the week - at only 99 cents for the Kindle edition! After suffering a feverish bout of mono, 13-year-old Oz awakes alone on the floor of his closet - in an abandoned house in an abandoned town & discovers the world overrun by man-eating monsters, the Takers. Reaching out & finding other survivors is his first mission & he soon learns his next, as he discovers that the present & future are controlled by the Storytellers. And the first Storyteller is Steve - a boy from his past who created a new world within comics, a world of good & evil where the Takers end the world and Oz is the hero. The Takers has been compared to both Stephen King’s epic The Stand and L. Frank Baum’s The Wizard of Oz, and for me it also had a strong feeling of Stephen King's Dreamcatchers with Steve being a little like Duddits and the Storytellers having the power of the future against the aliens. The Takers is a great read - incredibly suspenseful from the shocking first line onwards when we learn of Steve's death, and as we follow Oz through his abandoned house & town... running from shadows, terrified of his own thoughts and what they will bring out of those shadows. Listed as horror, certainly there are moments that will make the young reader a little squeamish - of course, it depends on their reading preferences. I picked up the paperbacks for my 4th grader & I know she'll love it as much as I did!